Metal is many different things, but lighthearted and jovial it is not. In fact, metal is incredibly image-conscious, having deeply defined aesthetics for each of its respective subgenres. It’s easy to tell the font of a black-metal band from that of a death-metal band, and if you’re a blackened death-metal band just, I don’t know, figure something out. 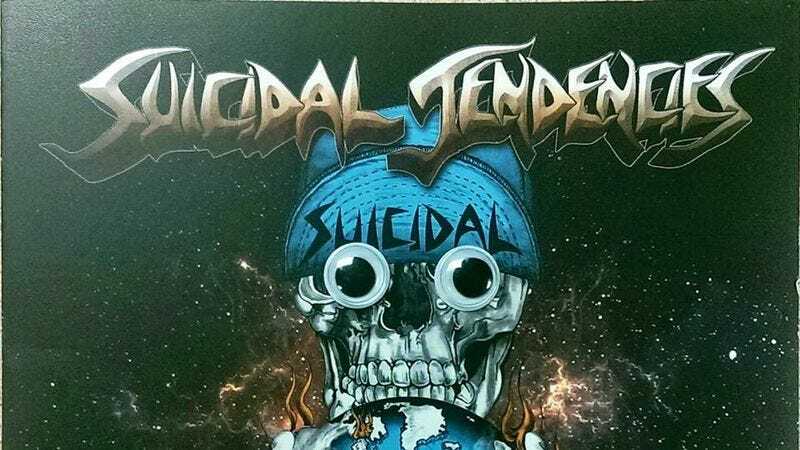 No place is metal more serious than on its album covers, where images vary among brutal, more brutal, and even more brutal, and it’s why the recently discovered Tumblr Metal Albums With Googly Eyes works so effectively. It’s a delightfully simple premise: Take a metal album and slap some googly eyes on it. Take, for example, the cover of Sabaton’s Heroes, which features an angry eagle statue, a couple lions, a helicopter, and some fire. Now look at it with googly eyes slapped on it. Isn’t that little guy so cute, ready to take over the world and everything? And here it kind of looks more like an owl, and who can be mad at a cute little owl? Now let’s take a glance at Morbid Angel’s Altars Of Madness, one of the defining images of death metal’s early days. It’s gruesome, with horrific faces ripping out of a portal. But let’s add some googly eyes to those pained faces. Now isn’t that a little better? Sure, they are horrific, but look at the smile on this little guy. Doesn’t it just warm your heart?